How do I know when I arrive? A well-thought approach based in business planning, marketing, growth and improvement, and training provides clarity, focus, and direction. 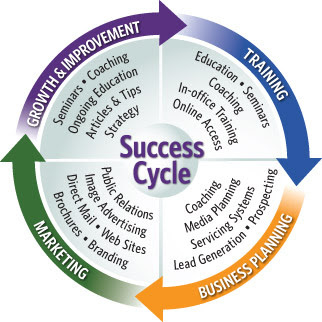 And, this approach provides for a continuous cycle for success. Two Spirit Group provides initial and ongoing support throughout this process. Whether you are launching a business or have been in business for years, call us to partner with you to achieve your business goals. We focus on small business and non-profit organizations, because we know that they power America. Small businesses and non-profit organizations know how to make a penny do the job of a nickel, because they have to. All of our pricing reflects that understanding. Broad-based management skills gained in 40+ years in hospitality, technology, education, publishing, and business communications. Proven record in business planning and development, marketing and advertising strategies, operational efficiency, quality improvement, and customer care.